Starring: Max Irons, Sam Claflin, Douglas Booth, Holliday Grainger, Natalie Dormer, Jessica Brown Findlay, Tom Hollander, Sam Reid. Plot: The film explores the lives of a bunch of spoiled young men from the English elite within the prestigious circle of Oxford University. 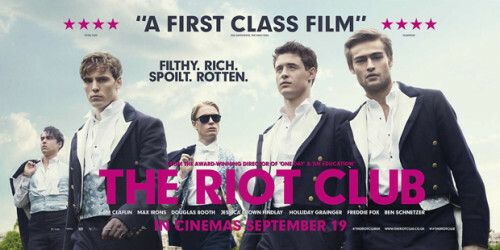 Today I’m going to share my thoughts about The Riot Club. First of all, I must say it was much more violent and harsh than I expected, so if you can’t bear violence then maybe you shouldn’t watch it. It is directed by Lone Scherfig (An Education, One Day) and is based on the play Posh by Laura Wade. The story itself is pretty simple. It centres around a group of students from the English elite. They all attend Oxford and they’re all spoiled as the trailer points out. They’re also filthy and rotten. A good start isn’t it? Some of the freshers are chosen by the seniors to be part of the ‘Riot Club’ which is a very old establishment dating back to the 18th century, when rich people were already helping each other and covering each others’ mess. The film itself is set in present day Oxford where things don’t seem to have quite changed since the 18th century. The rich are still depicted as holding power positions and judging others, especially the poor or even the middle class. Alistair Ryle, Harry Villiers and Miles Richards are the protagonists of the story and they are played by Sam Claflin, Douglas Booth and Max Irons respectively. All the characters are pretty rotten in their own way. They all indulge in heavy drinking, partying, trashing pubs and in general acts of gratuitous violence. The only character that stands up and deals with the chain of events the students find themselves involved in – and it all unfolds during one night at a pub – is definitely Miles (Max Irons). He is actually happy to be part of the Club at the beginning, but changes his mind later on as he fully realises what the membership entails. There are reasons why Miles makes up his mind and finally says no to his fellow club members, but you will better understand by watching the film. Among all the characters he was my favourite. He is the only one who has a relationship with a girl named Lauren (Holliday Grainger) who comes from a lower background. His relationship with her begins to crack as Miles becomes more and more involved with the Club. Despite the violence and the despicable acts some of the characters commit, I quite enjoyed the story. The actors’ performances were remarkable and I think the film showed very well how there are darker sides to the glittering world of wealthy people. I liked exploring that reality for a night, although I hope there are no students who actually go to such extremes. The film will engage you I’m sure, and if you watch it please let me know what you think in the comments. The ending is very meaningful, it wraps up nicely all the events in the story, so I hope you enjoy it.